Brunch menu tasting at Homer St. Cafe and Bar in Yaletown on September 29, 2013. After recently opening up and winning Georgia Straight's best new restaurant award, Homer St. Cafe is launching a new brunch menu. On this rainy Sunday morning, we were invited to preview and sample their selection before their general rollout. Homer offers some good value and nicely portioned dishes. For some reason, everything seemed to come with a poached egg (no complaints). 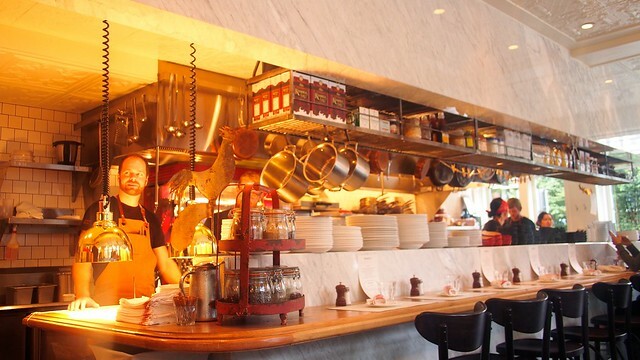 As always, I enjoyed the open chef's bar style kitchen and 1930's French bistro inspired concept. 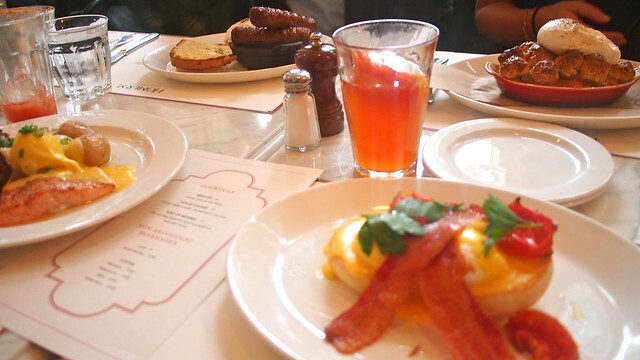 Brunch will be served on Sundays, starting October 6th. 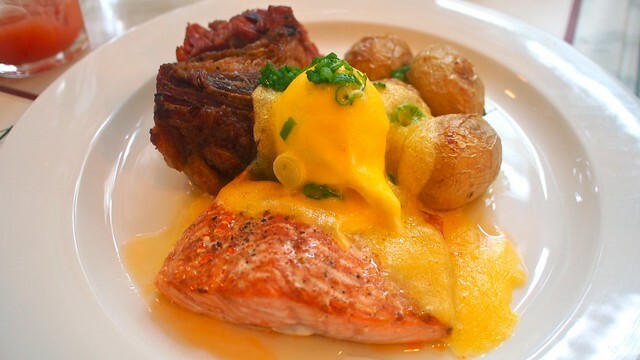 Grace ordered the baked steelhead trout and beef brisket and it looked dazzling as the most substantial, meatiest option. The brisket was tasty and thick but a tad dry as the potatoes were warm, moist, and delicious. 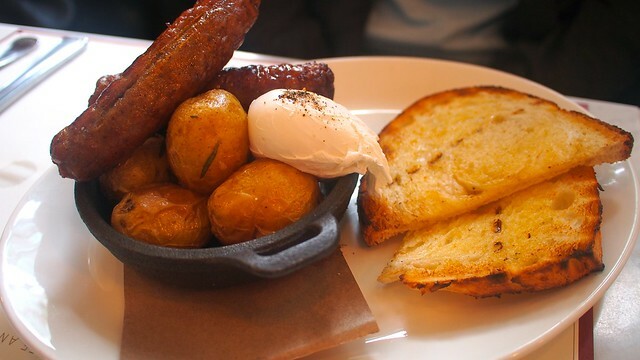 From the rotisserie, Kevin had the pork sausage (also available with pork belly) with poached egg, potatoes, and toast. Kevin seemed a little underwhelmed with the basic meal, wishing he chose the pork belly instead. 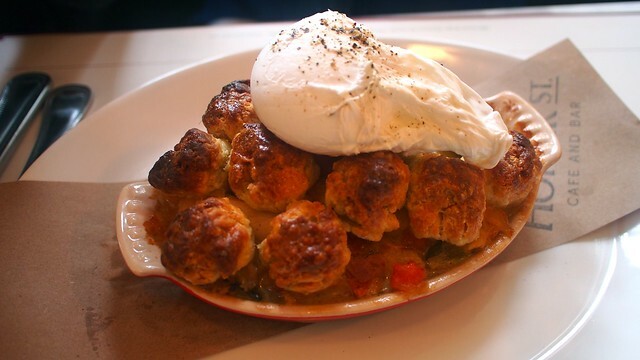 I had my brunch staple benny. Homer's Blackstone eggs benedict (with bacon, roasted tomato, and hollandaise sauce), although small-looking, was quite filling and very tasty. 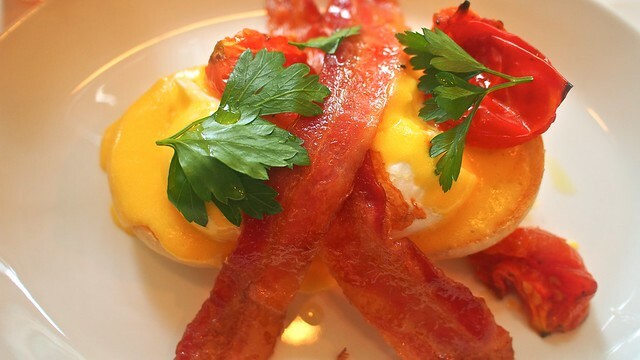 The poached egg was cooked just right and the bacon moist and flavourful. Tien's maple chicken cobbler was meaty and moist yet a mishmash of contrasting flavours between the egg and crust on top of the soupy chicken filling. 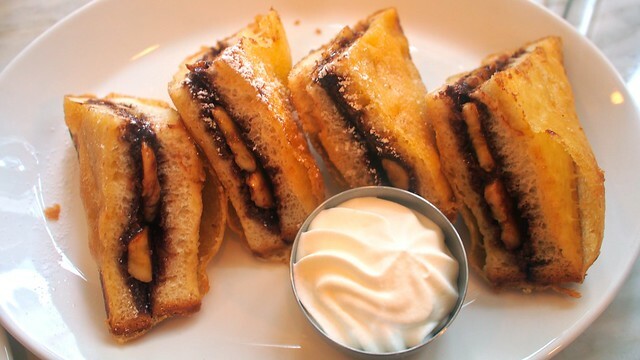 For dessert (sort of), we couldn't resist splitting a fried Nutella and banana Monte Cristo sandwich. This was so delicious and sweet, full of gooey choco-banana flavour. It's just as good as it sounds.